Accommodations for up to 10 Guests! 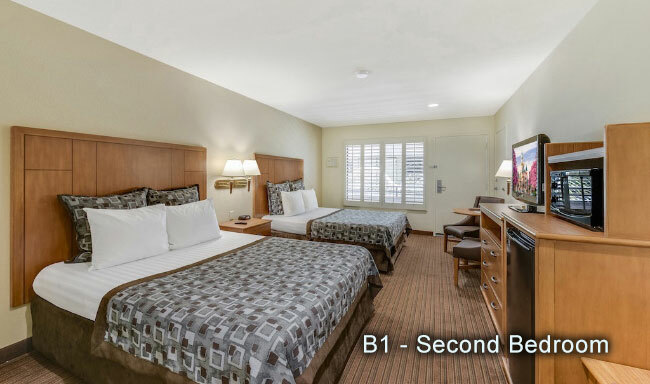 Anaheim Desert Inn & Suites is your home away from home when you visit Disneyland® Resort in Southern California. We offer expansive one, two, and three-room suites with plenty of space to relax after a full day exploring the local theme parks; perfect for both large and small families. Our rooms & suites feature all the amenities possible to make your stay as comfortable as can be. Featuring an LCD TV with premium HD cable channels, refrigerator, microwave, coffee maker, hairdryer, iron and ironing board, and in-room safe. 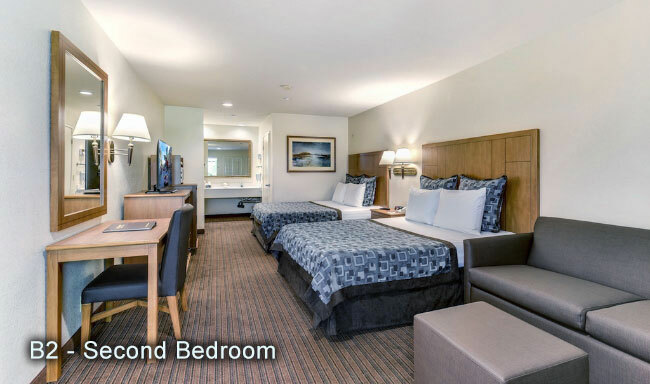 Relax after a long day of exploring area attractions when you stay in one of our deluxe rooms. 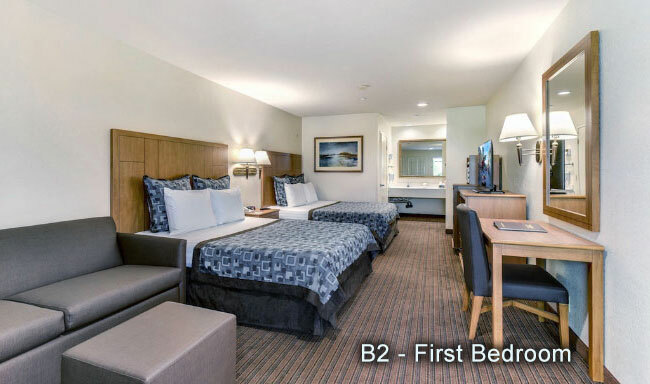 Spacious enough for four guests, our room features two queen beds, bathroom, and our many other in-room amenities: LCD TV, premium HD cable channels, refrigerator, microwave, coffee maker, hairdryer, iron/ironing board and in-room safe. Executive rooms are spacious enough for five guests. 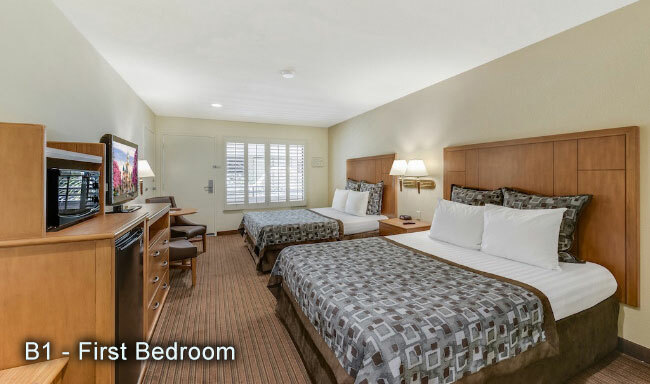 This room features two queen beds, bathroom, and our many other in-room amenities: LCD TV, premium HD cable channels, refrigerator, microwave, coffee maker, hairdryer, iron/ironing board and in-room safe. 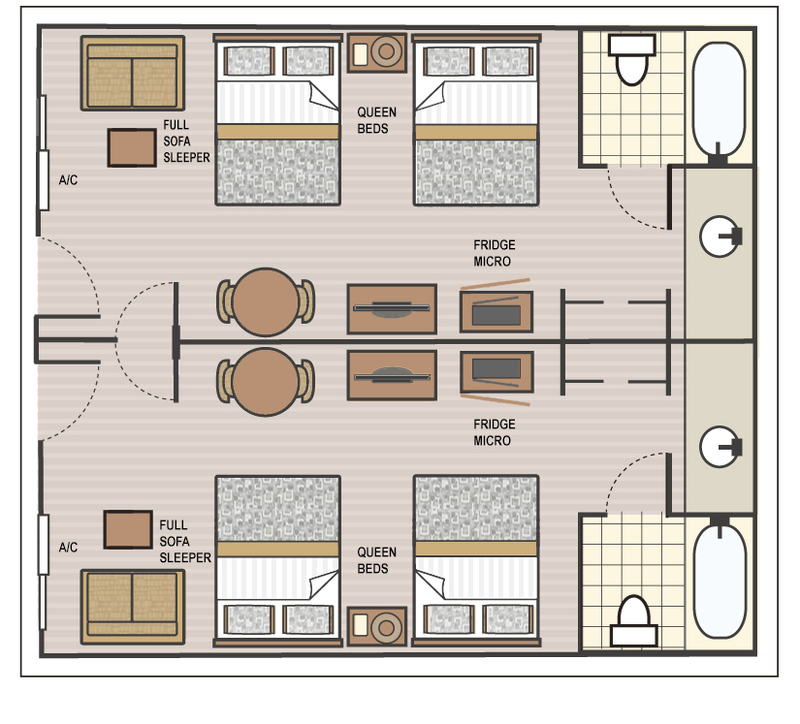 Enjoy the extra space and comfort offered by our Parlor Suite A. 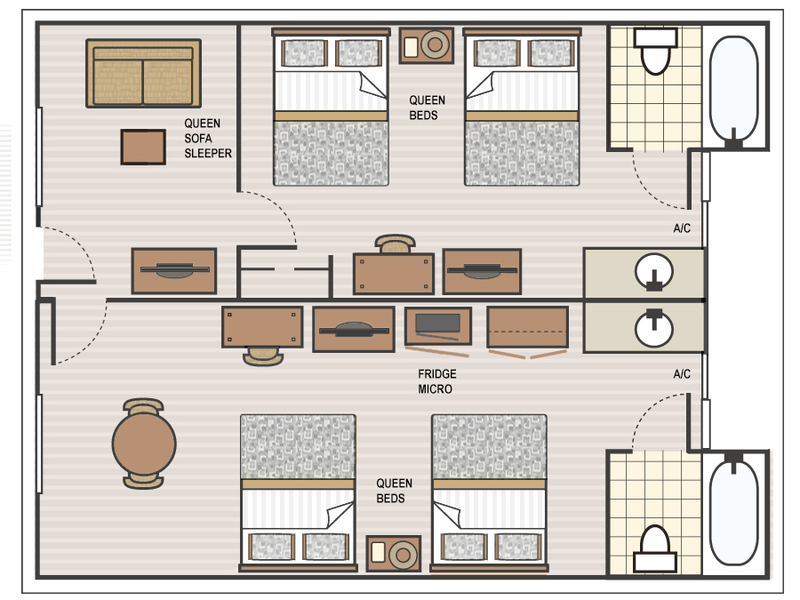 Our two-room parlor suite is perfect for family’s who need a little extra space. 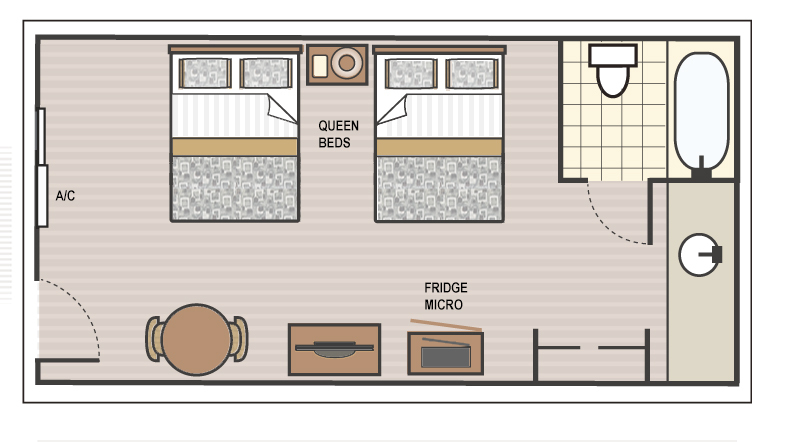 With two queen beds, a living room with a queen sofa sleeper, one bathroom, and our many other in-room amenities: two LCD TVs, premium HD cable channels, refrigerator, microwave, coffee maker, hairdryer, iron/ironing board and in-room safe. Keep your friends & family together without compromising on comfort and privacy when you book a stay in this two-bedroom suite. 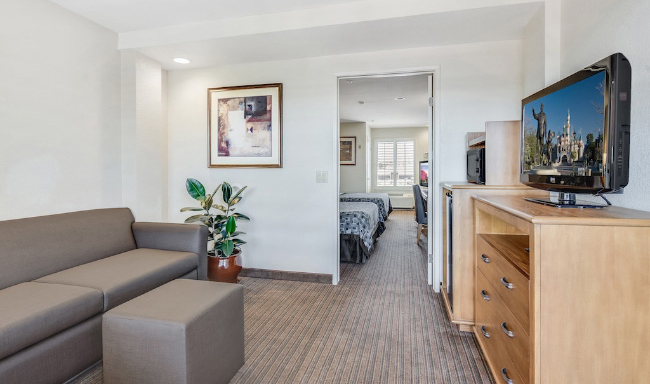 This family-sized suite features four queen beds, two bathrooms, and two LCD TV's, and our many other in-room amenities: premium HD cable channels, refrigerator, microwave, coffee maker, hairdryer, iron/ironing board and in-room safe. Gather the whole family or your favorite friends together in one place when you reserve our expansive, 10-person suite. 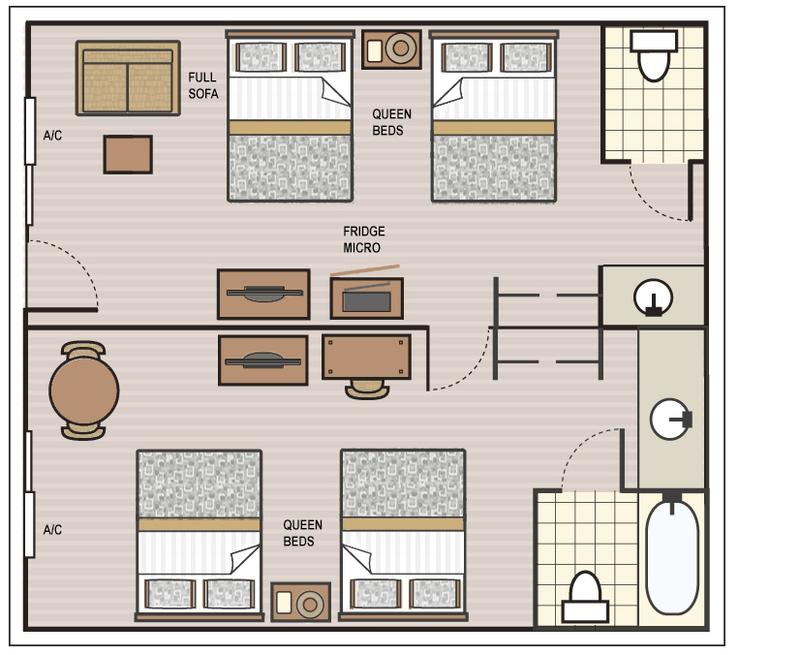 This suite comes complete with two bedrooms featuring four queen beds, two full sofa sleepers, two bathrooms, and two LCD TV's and our many other in-room amenities: premium HD cable channels, refrigerator, microwave, coffee maker, hairdryer, iron/ironing board and in-room safe. We offer expansive suites with plenty of space to relax after a full day exploring the local theme parks. 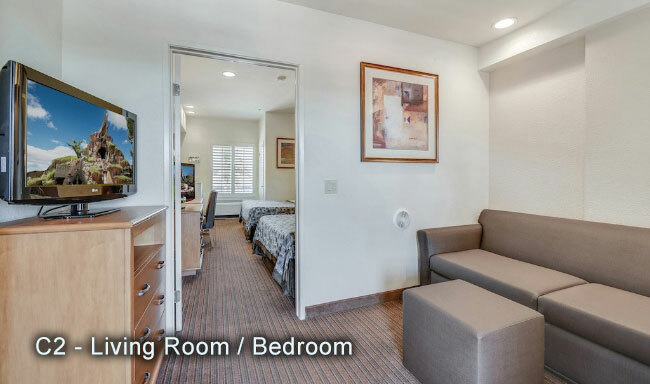 In this two-bedroom suite, you and your family have room to relax and stretch out. Our suite features four queen beds, one-and-a-half bathrooms, a living area, and two LCD TV's, and our many other in-room amenities: premium HD cable channels, refrigerator, microwave, coffee maker, hairdryer, iron/ironing board and in-room safe. 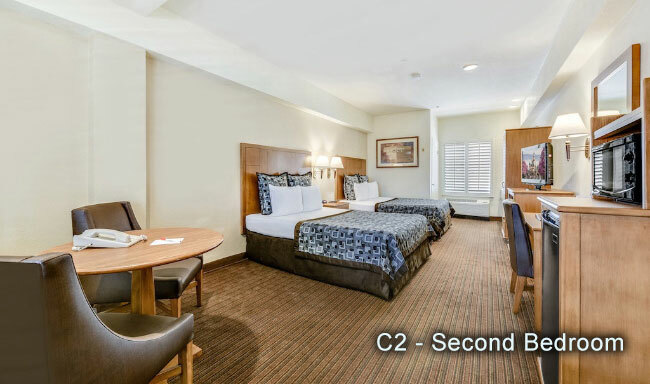 Home is never far away when you stay in our C2 Parlor Family Suite. This expansive suite is designed with three rooms—enough space to comfortably accommodate everyone. 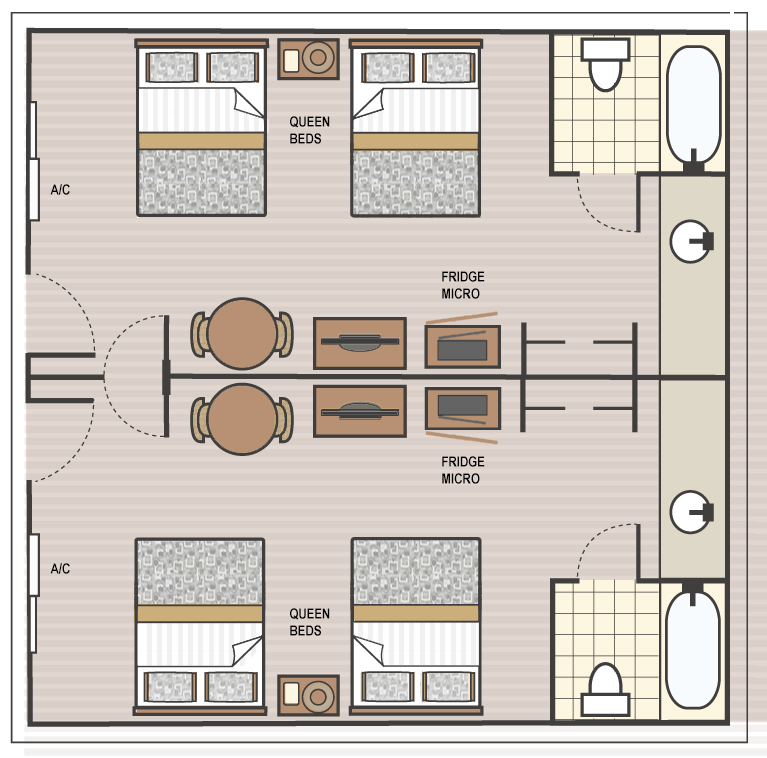 Include two bedrooms, four queen beds, and a separate living room with a queen sofa sleeper; two bathrooms and three LCD TV's. 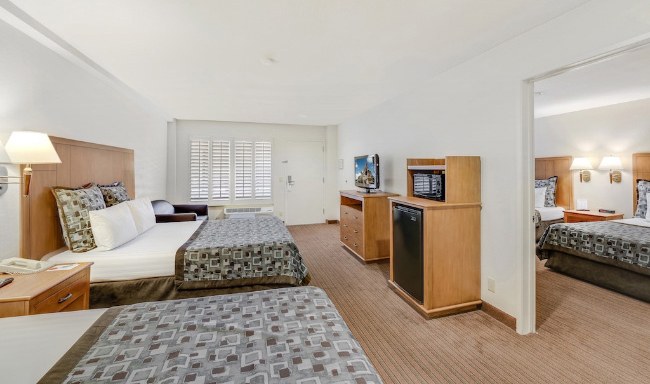 Enjoy our many other in-room amenities: premium HD cable channels, refrigerator, microwave, coffee maker, hairdryer, iron/ironing board, and in-room safe. (Floor plan might differ).